Here at Transportify freight logistics company, we do our best to give quality service to our valued clients, which includes our fast performance when it comes to transporting packages. To give every client Transportify’s fast courier performance, we also need them to cooperate with us for smoother transactions. Thus, we at Transportify would like to inform our valued clients about our Waiting Time Policies. Waiting Time is a consideration that Transportify gives to late clients. It refers to the time that Transportify driver partners spend waiting for late clients. There are certain rules that Transportify driver partners follow regarding the Waiting Time. Under the Transportify Waiting Time Policy, Transportify delivery driver partners must give late clients a maximum of one hour Waiting Time, free of charge. But after the free one hour Waiting Time, the client will be charged P50.00 every 30 minutes for the succeeding hours that he is still late. This is to discourage clients from abusing their Waiting Time privileges. Please keep in mind that Transportify driver partners have other scheduled delivery requests from other clients and each client’s punctuality affects the driver partner’s delivery schedules. Transportify driver partners have the right to call our customer service representatives to cancel bookings with tremendously late clients. If the driver arrived at the meeting place on time but the client failed to show up after some hours, the driver’s cancellation request will be considered valid as Transportify must take into consideration that the driver partner has other Transportify on-demand delivery app requests he must fulfill. The best way to avoid being charged with Waiting Time fee and having a Transportify driver partner cancel your booking is by being punctual. It would make transactions smoother and faster if clients would show up on schedule. We would also appreciate it very much if the packages are ready for pick up upon the driver partner’s arrival to avoid wasting time. Please keep in mind that we only implement Waiting Time charges and booking cancellations with the sole intention of being on time for our other customers, because we value all our clients’ time equally. We would also like to take this opportunity to remind our clients that we value our Transportify driver partners as much as we value our clients, because driver partners play a major role in making our logistics operation possible. In line with this, we would like to ask our clients to treat all our drivers with the respect they deserve. Whether you rent a Transportify car, an L300 van, or a closed van truck, please be sensitive and considerate on how the drivers are treated. We hope you understand that the policies and rules Transportify tries to implement are in accordance with our desire to provide quality service for all. 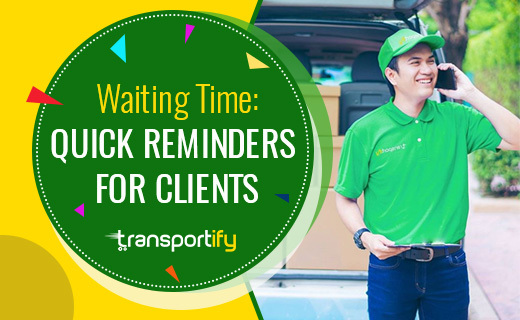 Some quick reminders for our valued clients: Waiting Time is the time a Transportify driver partner spend waiting for a client. Clients that are late for more than an hour are subject to Waiting Time charges and may even be subjected to booking cancellations. To avoid charges and cancellations, we advise our clients to be punctual when making transactions with Transportify.